Congrats to Our Edible Books 2015 Winners! Thanks to all who entered our Fourth Annual Edible Books Contest! Your confections look amazing, and my only regret is the sugar craving you’ve left in your wake. 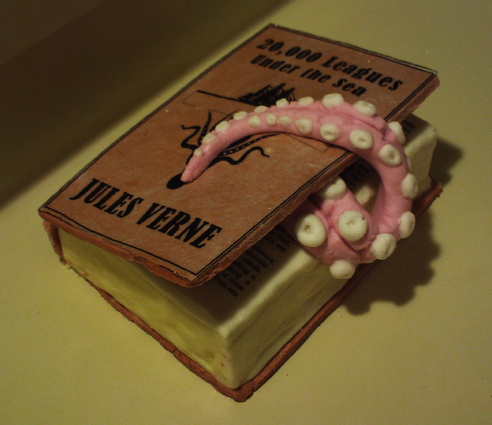 You can check out all the submissions for this year’s Edible Books Contest over in the “EdibleBooks2015″ tag gallery. Without further ado, I present our winners for 2015. 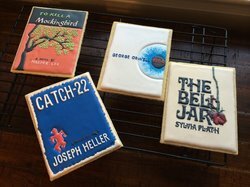 This year’s grand prize goes to LT member W.MdO, whose assortment of sugar cookie book covers from iconic works like To Kill a Mockingbird and Catch-22 wowed us all. Iced by hand entirely with royal icing, most of LT Staff agrees, these look almost too good to eat. We’d be willing, though, to save anyone else from having the destruction of such masterpieces on their conscience. In addition to the requisite fame and glory, W.MdO will be receiving $50 worth in books, hand-picked by LT Staff! We’ll also be sending some LT swag their way: an LT t-shirt or tote bag, an LT library stamp, a CueCat barcode scanner, an LT sticker, and two lifetime gift memberships, to bestow as they see fit. Amazing work! Our first runner-up award (and the accompanying prestige and prizes) goes to LT member powerfulpotentiality, for their truly magical (sorry) cake, inspired by Annie Sage’s fantasy novel, Magyk. 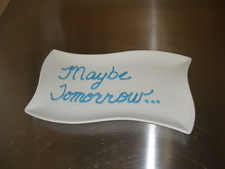 powerfulpotentiality’s work is the spitting image of the tome itself, in cake form—crafted as a hummingbird cake (banana pineapple spice cake, for the uninitiated) with browned buttercream frosting. I’d love to know how our baker achieved the shimmer gold effect on the accents! Second runner-up honors (and prizes) go to LT member gofergrl84, for their impressively faithful reconstruction of the eponymous cake, from Allie Brosh’s Hyperbole and a Half masterpiece, “The God of Cake”—if you haven’t read this yet, go do it, now. Complete with looming caricature of the author in the background and marshmallow animals, we can only wonder how gofergrl84 managed to contain the need for sugar long enough to photograph their work. Well done! Winners, be sure to check your profile comments shortly for details on claiming your prizes. Competition was fierce this year—while it was a small batch, the sheer quality across the board submissions really knocked our socks off. I’d be remiss if I didn’t give a special shout-out to StJohntheBaptist‘s heartfelt and detailed pop-up cake, depicting the grand opening of their church’s lending library. LT member marcottm made a beautiful, hand-painted Rice Krispie treat castle, complete with a boy and his dragon, inspired by When a Dragon Moves In. The apple pie shipwrecked on an island of marshmallows created by milibrarian was clever and sounds delicious! And—particularly as a fellow cat-owner—morningwalker‘s cat box cake (complete with scoop!) amused me to no end. You are all far better bakers than I. Thanks so much for sharing your talents with us! Today marks the launch of our 2nd Annual AllHallowsThing Contest! “What is AllHallowsThing?” you ask? Last year, we asked you to send us pictures of your literary-themed Halloween costumes and pumpkins, and boy, were we impressed.Your submissions knocked our socks off. Help us celebrate Halloween once again! Choose one (or both!) of the two categories. Costume: Dress up as a character, object, etc. from your favorite book. Pumpkin: Decorate a literary pumpkin! Take photos of your costume/pumpkins. Upload your photos to your member gallery. Be sure to tag your photos. Tag them with “AllHallowsThing2014“. Yes, capitalization matters. Go ahead and add a title, description, etc., detailing how you made your costume or creation. Deadline: Be sure to submit your costumes and pumpkins by 6pm Monday, November 10th to be considered for one of our fantastic prizes! On November 11th, LibraryThing staff will have a top secret meeting in which we’ll choose winners for each category. One (1) book from their LibraryThing wishlist (up to $25). Fine print: You can enter as many times as you like, to either category, but you can only win one prize. By entering the contest, you certify that your creation is your own. All decisions regarding winners will be made by LibraryThing staff, and our decisions are final, damn it. LT staff and family can enter, but can only be honored as prize-less honorable mentions. We reserve the right to use your photo, but the copyright remains yours. You can release them under a copyleft license. Questions? Comments? Post links and questions here on Talk. 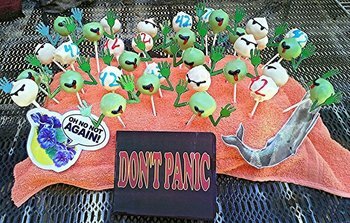 LibraryThing’s 3rd Annual Edible Books Contest! 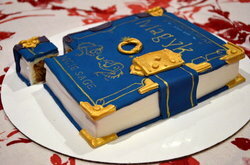 April has finally arrived, and with it, LibraryThing’s THIRD annual Edible Books Contest! Members served up a tasty batch of literary delights last year, and we’re expecting another strong showing in ’14. 2. Take photos of what you made. The photo on the right is the grand-prize winner from last year’s contest, inspired by David Wong’s books. You can see other submissions from last year in the EdibleBooks2013 gallery. If your creation is super realistic, take a photo cross section of your creation as you eat it! 4. When adding the image, be sure to tag it “EdibleBooks2014“. This will add your image to the contest gallery, and counts as your entry. If your photo doesn’t have that tag, we won’t know that you’ve entered. You can see current entries here. DEADLINE: The contest will run for three weeks. Add your photos by 6pm Eastern on Tuesday, April 29th. As always, we will pick a few Honorable Mentions from the batch of entries. The more entries we receive, the more Honorable Mentions we can make—and all of them will get lifetime gift memberships. *Surprise books will be chosen by LibraryThing staff from Portland, ME’s newest indie bookstore, Sherman’s! We’ll make our selections based on the winner’s library. To celebrate Halloween, LibraryThing is introducing a brand new competition, “All HallowsThing.” It could help you decorate for the big night, or even inspire that costume you are worrying about! Choose one of the two competition categories, or submit to both. Literary Costume: Dress as a character or object from your favorite book. Pumpkin Creations: Make a literary pumpkin! Upload your photos to your gallery. Be sure to tag your photos. Tag them AllHallowsThing2013. Go ahead and add a title, description or whatever, detailing how you made your costume/creation. Deadline: The deadline is by 6 pm, Eastern on November 8th to be considered for our fabulous prizes! The staff at LibraryThing will choose the winners of each category. Fine Print: You can enter as many times as you like, but you can only win one prize. By entering the contest you certify that your creation is your own. All decisions as to winners will be made by LibraryThing staff, and our decisions are final, damn it. LibraryThing staff and family can enter, but can only be honored as prize-less honorable mentions. We reserve the right to use your photo, but the copyright remains yours. You can release them under a copyleft license. Questions? Post links and question on this Talk topic. Thanks to everyone who entered our second annual virtual Edible Books Contest! Once again your biblio-culinary talents impressed and amazed! Check out all of the entries in the gallery. The grand prize goes to new member GSCK for this sinister tableau of books by David Wong: This Book is Full of Spiders and John Dies at the End. 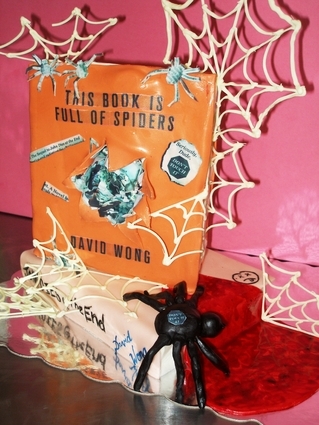 The books are made of vanilla and chocolate cake, with fondant and white chocolate spider webs. Another view here. Along with the honor and fame, GSCK wins a $50 gift certificate to Longfellow Books, an LT t-shirt, stamp, and sticker, plus a CueCat and three lifetime gift memberships to LibraryThing! Our second runner-up this year is v4758, for a birthday cake of “desert island books,” made from “innumerable batches of Victoria sponge and enough fondant icing to satisfy even the sweetest tooth.” v7458 even provided a cross-section. 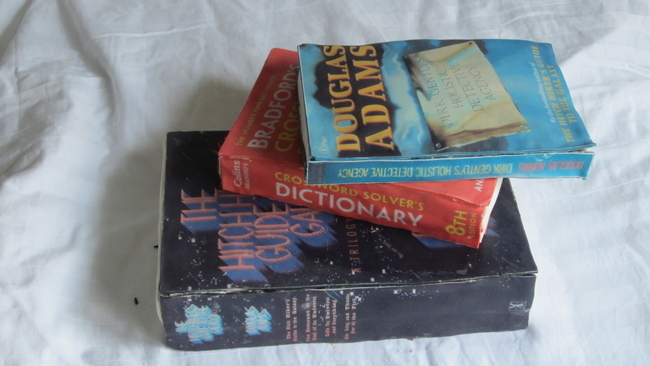 The books are Douglas Adams’ The Hitchhiker’s Guide to the Galaxy and Dirk Gently’s Holistic Detective Agency, as well as Bradford’s Crossword Solver’s Dictionary. We also chose a couple of Honorable Mention winners; each will receive a lifetime gift membership. These are jorkar for an axolotl cake to celebrate the release of Susan Hood’s Spike, the Mixed-up Monster and debwalsh51 for her take on Erin Morgenstern’s The Night Circus. I’ll be contacting the winners to claim their prizes. Congratulations to our winners, and thanks again to all the entrants! 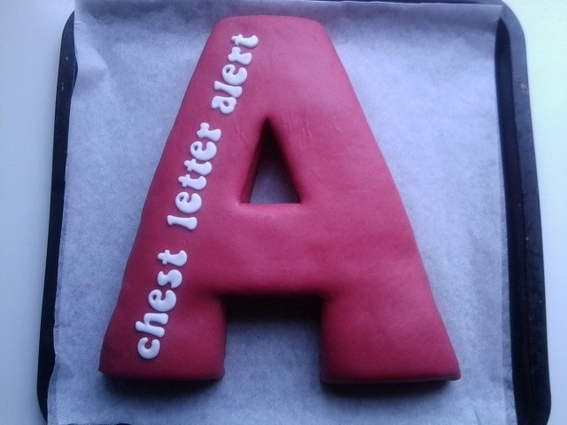 Edible Books Contest deadline extended! It’s been just a little bit busy around here these past few days, so we’re going to extend the deadline for entering this year’s Edible Books Contest. The new deadline for entry is 4 p.m. EDT on Thursday, April 18. The original post is below, with all the contest info, how to enter, all the prizes, and more. 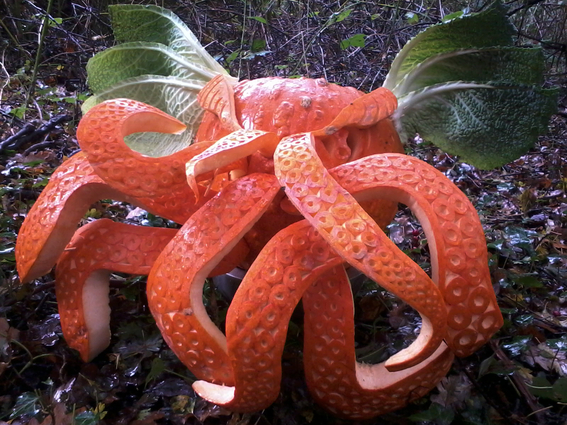 Check out all the entries submitted so far at the EdibleBooks2013 gallery. We had so much fun with last year’s virtual Edible Books Contest, we’ve decided to make it an annual event! 2. Take some photos of what you made. The photo at right is the grand-prize winner from last year’s contest. See more of the winners here or all of the entries in the gallery. 4. When adding the image, tag it “EdibleBooks2013″. This will add your image to the contest gallery, and counts as your entry into the contest. If your photo doesn’t have the tag, we won’t know that you’ve entered. You’ll be able to see all the entries here. Deadline: Add your photos by 4 p.m. EDT on Thursday, April 18. Fine Print: You can enter as many times as you like, but you can only win one prize. Your dish must be made of edible ingredients (no hats, lost-wax sculptures, performance art), and by entering the contest you certify that it is your own creation. Entries submitted to previous LibraryThing Edible Books contests will not be considered. All decisions as to winners will be made by LibraryThing staff, and our decisions are final. LibraryThing staff and family can enter, but can only be honored as prize-less runners-up. Any images you load stay yours, or you can release them under a copyleft license, but we get a standard “non-exclusive, perpetual” right to use them. The 2nd annual LibraryThing Edible Books contest! Deadline: Add your photos by 4 p.m. EST on Thursday, April 4. “The Casual Vacancy” Review contest winners! 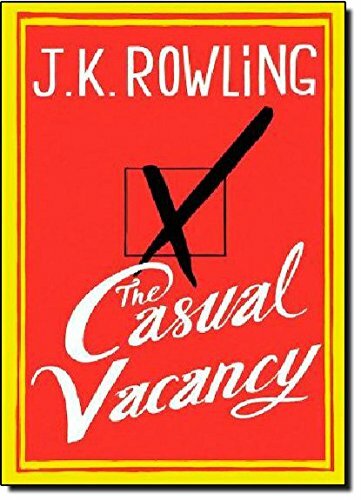 Drum roll please … I’m happy to announce the winners of the review contest for J.K. Rowling’s new novel, The Casual Vacancy. As promised the top three reviews (those with the most “thumbs-up” when the contest closed) win a $50 gift card to Amazon, Abebooks, Booksense, or any independent bookseller of their choice, a LibraryThing t-shirt and a lifetime membership (to keep or give away). Seven runners up* (the next seven reviews with the most “thumbs-up”) win a LibraryThing t-shirt and a free lifetime membership (to keep or give away). We didn’t have forty additional reviewers who both wrote a review and voted for others’ reviews, so everyone who did that will each receive a year’s free membership (to keep or give away). Congratulations to everyone who participated! If you won a membership: I’ve upgraded your own if you weren’t already a lifetime or annual member; otherwise, go here to send your gift membership. For winners of the top prizes, I’ll be sending you a profile comment shortly!